Do you know what smudging is? It is an ancient ritual that connects our body and physical space to the Divine, through the burning of white sage. This can work wonders for you! In this article, we will talk about everything you need to know about smudging. Smudging is an ancient ritual that began with the North American Indians. These ancient tribes believed that the aroma of certain herbs had the power to connect our body to the spirit quite efficiently. White sage is a plant that grows in California’s arid environments and has quite special characteristics. While most plants can not survive high temperatures, this is one of the few that can. This is because its leaves are capable of generating by themselves a high quantity of essential oils, making their leaves flexible and guaranteeing their hydration. “Sage” comes from the Latin word salvea, which means “salvation.” These Indians recognized sage as a sacred plant not only by their physical characteristics, but also by their spiritual capacities. They believed that the scent of the white sage purified not only our body but also environments and personal objects. The power of purification was so strong that they threw pieces of the plant into the bonfires with the intention of purifying even the fire itself. 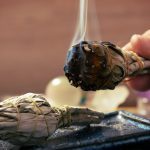 As we said, smudging is a ritual created by the North American Indians, but the practice spread throughout the world for the quality of this sacred plant. In addition to all these properties, it has a sweet and pleasant aroma. Nowadays, it is difficult to make a bonfire as easily as the Indians. However, it is not so complicated to practice smudging, since this ritual has been updated. You can purchase white sage that comes in the form of rolls (a wand) or small pieces that come in bags, for a more affordable price. Incense lovers can also find sticks with this scent and the essence of the plant. To purify your body, you must first burn off the white sage and shake it with a feather in order to release its smoke. Then you should surround your body with the smoke, while enjoying the benefits that this plant is able to bring. Let the smoke in contact with your body. Take a deep breath and feel the inner and outer peace. To purify an environment, first make sure that you are very careful to not damage furniture or other objects. Place the white sage on a heat-proof burning surface as the Abalone shells or some types of rock. Let the herb burn for a time and just as you did with your body, use a feather to wipe the smoke through the environment. It is important that you do these rituals while you are calm and available. Take time for yourself, meditate, and feel truly purified. Keep positive thoughts while smudging. When you move to a new space.